Augusta – It is with great sadness that the family of Mack Arthur Reeves, Sr. announces his passing after an extended illness. Mack was 74 years old. He leaves behind his beloved wife, companion, fishing buddy and best friend for 54 years, Sue (Tomes) whom he loved dearly and with whom he enjoyed many fun and happy times; his only son and namesake Mack Arthur Reeves, Jr (Sandy); two daughters Cyndi Reeves (Augusta) and Rhonda Brown (Atlanta); seven grandchildren Joshua Bo Brown (Amanda) (Grovetown); Milinda Martin (Greg) (Atlanta); Justin Reeves (Augusta); Kayla Reeves (Eric) (Augusta); Nick Brown (Atlanta); Payton Fields and Morgan Fields (North Augusta); his baby sister Robbie Ann “Sis” Dunn (Marvin) (Dearing) with whom he was very close; one brother Ira Reeves (Lincolnton); one great grandchild whom he adored Aiden Brown and one special great-grandchild Lane who will be meeting him at Heaven’s gate; a special Uncle Lynn Reeves, Sr. (Dearing) who was a best friend for more than 60 years; a precious Aunt Sallie Usry whom he loved dearly and many nieces, nephews, cousins and friends. Born and raised in Dearing, Georgia the son of the late Robert and Lona Reeves, he was a resident of Augusta for 60 years. He was a member of Oak Grove Baptist Church. Mack was a retired auto mechanic and enjoyed his time at Roberts Chrysler Plymouth for 35 years. Mack loved deep fried southern food, fishing at Raysville Marina, planting 6 ft tall tomato plants, working on cars, racing, estate sales and his family. He was loved by many for his wonderful sense of humor, his famous fish frys at the lake and his incredible Christmas decorations that lit up the street for many years. Mack would like you to know that his work here is done. He received a call, a sort of offer you can’t refuse, for an appointment from which he will not be returning. Pallbearers will be Kenny Darnell, Frank Moore, Jeff Hadden, David Worley, Lynn Reeves, Jr. and David Smith. 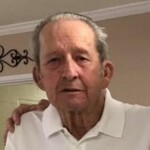 A funeral service will be held at Chance and Hydrick, Richmond Hill Road on Monday, April 1, 2019 at 2:00 PM with his Pastor and family friend the Reverend Jerry Wilson officiating, with burial at Hillcrest Memorial Park. Visitation will be Sunday, March 31, 2019 from 5:00 – 7:00 pm at Chance and Hydrick Funeral Directors, 2502 Richmond Hill RD, Augusta, GA 30906. You have my deepest sympathy for your loss. May God provide you with comfort during this grievous time. Be assured that one day soon God will do away with death forever. 1 Corinthians 15:26.